As of July 1, there were 17,780 U.S. dealerships, a 0.4 percent decrease from six months earlier. DETROIT -- The average number of unit sales per U.S. dealership will continue to rise this year, driving dealership profitability higher, before leveling off next year, a new report says. Throughput, which is the average number of sales per dealership, will rise 8 percent to a record 877 units in 2013 based on projected U.S. light-vehicle sales of 15.6 million, Urban Science, a global retail consulting firm in Detroit, predicted today, based on data in its 2013 midyear Automotive Franchise Activity Report. The predicted rise would extend an unprecedented throughput increase to four straight years. In 2012, throughput rose 13 percent to 812, by Urban Science's count. "While throughput levels are on track to crush last year's all-time high, we believe we're hitting the top of the curve," said John Frith, vice president, Urban Science, in a statement. "If we follow historical trends, throughput increases should slow in the next year or two before they start a mild decline." The forecast of 15.6 million sales in 2013 comes from LMC Automotive. Frith said automakers are keeping their retail networks "stable even as sales continue to rise." The midyear report shows a slight decline in the number of U.S. dealerships since the end of 2012. As of July 1, there were 17,780 dealerships, a 0.4 percent decrease from the 17,851 tallied six months earlier. The number of franchises also slightly decreased. They fell 0.6 percent to 31,409 as of July 1. The retail network stability creates "a tremendous opportunity for dealerships to reap the benefits of the industry's most profitable periods in two decades," Frith said. The majority of dealership closures resulted from the loss of the Suzuki brand, which shut down 222 franchises, including 125 stand-alone dealerships, the report said. The rest of the network generally remained healthy and grew slightly since the beginning of the year. 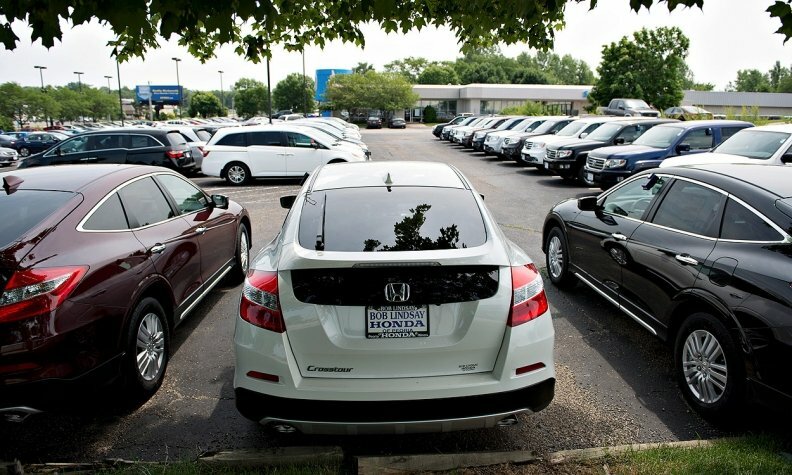 At the state level, the most significant net dealership declines occurred in New Jersey, which lost eight dealerships, followed by Missouri and Pennsylvania which each lost seven dealerships, the report said. California experienced the most significant dealership increase, gaining 20. Texas added four dealerships and Arkansas, Louisiana, Nevada and Tennessee added two each. DETROIT, July 31, 2013 — Urban Science released statistics and insights today from its 2013 midyear Automotive Franchise Activity Report (FAR), which projects that throughput — the average number of sales per dealership – will rise to 877 units in 2013 based on vehicle sales of 15.6 million*. This extends an unprecedented three-year throughput increase to four years and further heightens dealership profitability. The midyear FAR shows a slight decline in the number of automotive dealerships in the United States since the end of 2012. As of July 1, 2013, there were 17,780 dealerships (rooftops), a 0.4 percent decrease from last January's total of 17,851. The number of franchises (brands a dealership sells) also decreased slightly — 0.6 percent — from 31,608 franchises on January 1, 2013, to 31,409 as of July 1, 2013. "Automakers are keeping their retail networks stable even as sales continue to rise, creating a tremendous opportunity for dealerships to reap the benefits of the industry's most profitable periods in two decades," said John Frith, vice president, Urban Science. "While throughput levels are on track to crush last year's all-time high, we believe we're hitting the top of the curve. If we follow historical trends, throughput increases should slow in the next year or two before they start a mild decline." According to the report, while dealership and franchise counts decreased slightly during the first six months of the year, the majority of closures resulted from the loss of the Suzuki brand, which shut down 222 franchises, including 125 stand-alone dealerships. The rest of the network generally remained healthy and grew slightly since the beginning of the year; 97 percent of markets remained stable and experienced virtually no net fluctuations since the end of 2012. FAR data shows that at the state level, the most significant net dealership declines occurred in New Jersey (eight dealerships); Missouri and Pennsylvania (seven dealerships each); and Florida, Indiana, Maryland, New York and Washington (six dealerships each). California experienced the most significant dealership increase (20), while Texas added four dealerships and Arkansas, Louisiana, Nevada and Tennessee added two each. *Unit sales of 15.6 million forecasted by LMC Automotive. Urban Science maintains a list of current new vehicle dealership and franchise information for all car and light truck brands in the United States. Compiled on a monthly basis, the census is the most reliable source of dealership statistics. The data comes from a variety of sources, including feeds from automotive manufacturers as well as phone and field verification. Urban Science has been collecting this information since 1990 and compiles a yearly analysis every February for the previous year in its annual Automotive Franchise Activity Report. Founded in 1977, Urban Science is a global retail consulting firm that takes a scientific approach to help companies identify where they should allocate resources in order to increase their market share and profitability in the most effective and efficient manner. With headquarters in Detroit, Urban Science serves its global clientele from offices in the United States, Spain, UK, Germany, Italy, France, Australia, China, Mexico, Russia and Japan. For more information on Urban Science, visit www.urbanscience.com.